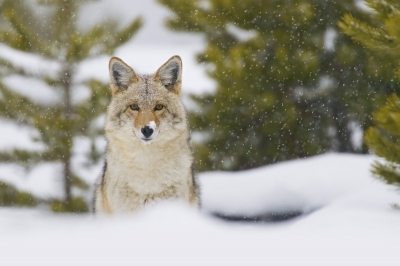 Coyotes frequently hunt bobcats and domestic cats (and smaller dogs) if they can get them. Wolves have been known to kill pumas and sometimes they kill domestic cats as well. Domestic cats are also attacked occasionally by raccoons, foxes, owls, eagles, and hawks (though the avian predators are more likely to go for kittens than large adult cats). Some dogs (especially those of particular breeds such as Weimaraners) may hunt cats if they haven’t been socialized with them from a young age. However, despite their reputation as natural enemies, cats and dogs can learn to get along well, particularly if they are raised together. Some cats and dogs even become the best of friends. It’s also possible, though trickier, to encourage friendships among adult cats and dogs. In this case, the key to success is controlling the dog and letting the cat take charge of the situation at her own pace, as she will be the more fearful of the two, given the size difference (the exception to this is introducing a large cat to a very small dog). For answers to more cat questions, see the main Cats page.